We don’t usually start our posts with a picture, but this is worth a least a thousand words! One in particular — “Wow”. 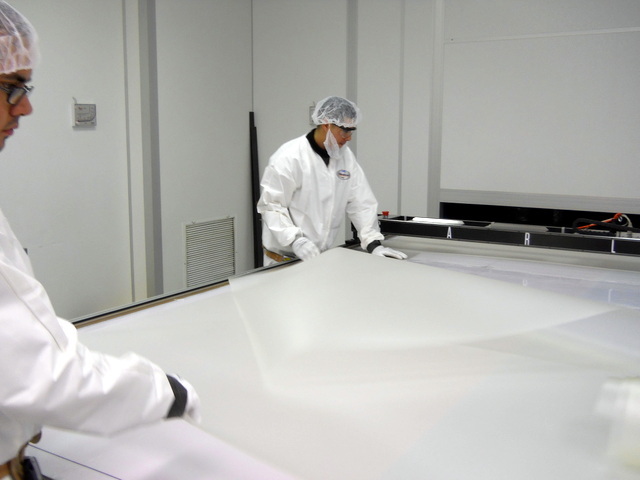 Lamination is the process where two pieces of glass are joined with plastic films to produce a stronger sandwich that is harder to break and safer when broken. 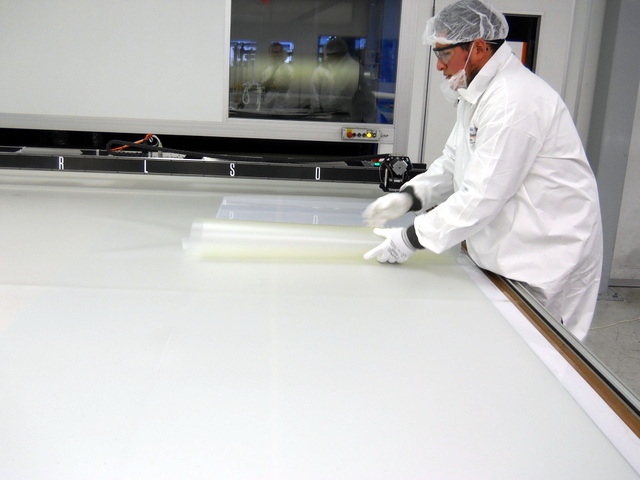 Lamination rooms are climate-controlled clean rooms used to store film and make clean layups prior to entering a special oven. 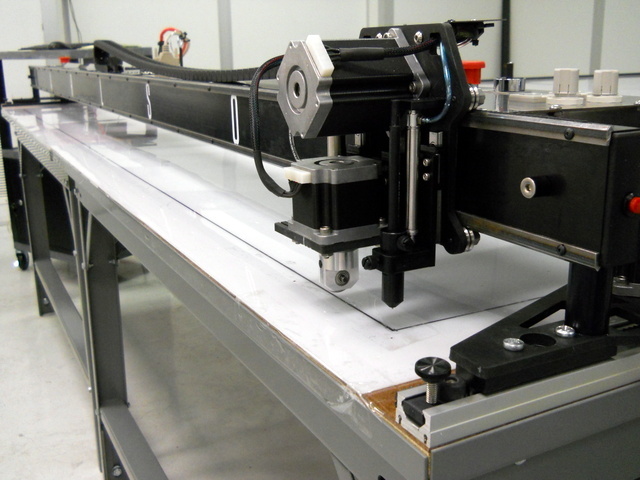 The cutter is used to quickly and efficiently cut the interlayer film on demand to fit. The lamination room, where we spent most of our time, is impressive. It’s clean, well run, and HUGE — the room is ~60’x~60′ and held at a constant 60 degrees F. It’s big because they handle big glass, and large volumes. On any given day they will cut 2000-4000 sqft of PVB and SGP. Panorama of cutter and room. Remember our table is 9'x12'. This means, material savings make a big difference. 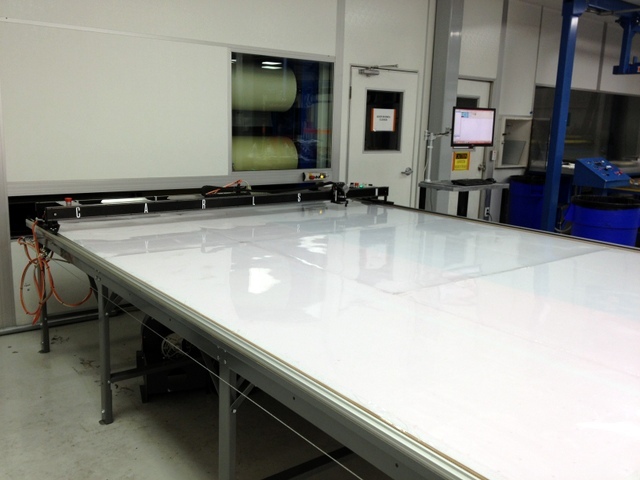 Todd Neufeld, the pant manager, said, “Automating was a ‘no-brainer’ for material savings alone.” Just like automated glass cutting and nesting, automating nesting and cutting laminate can result in 10-40% material savings. That’s a big deal considering the proportionally high cost of PVB vs. Glass. 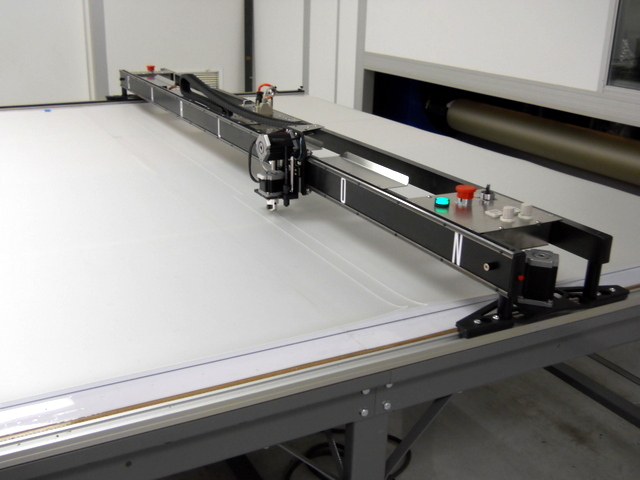 Often our laminate cutting system’s will pay for themselves in the first few months. While Carlson Design offers a range of nesting and autonesting software, Carlson Design worked with Oldcastle to integrate their glass nesting software company, PMC Software, into the system. 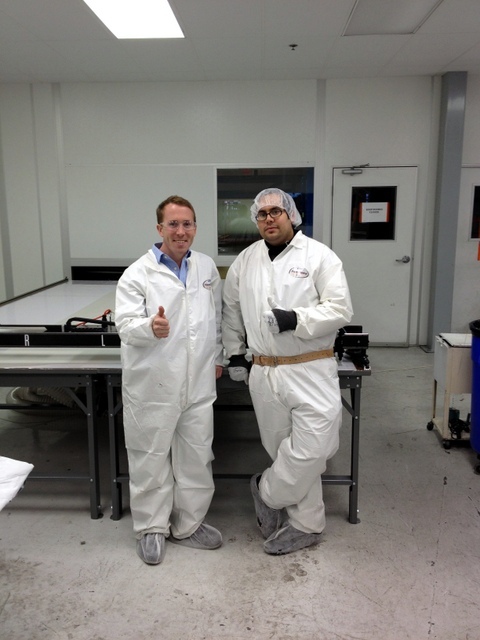 PMC is the industry leader in glass and window nesting and optimization software. 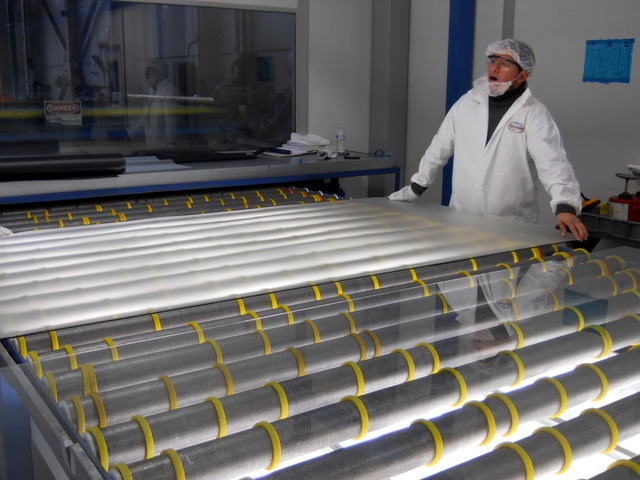 They input the incoming glass rack number and PMC oversizes the lami-cuts and autonests the pieces across different roll widths ranging from 96″-36″. 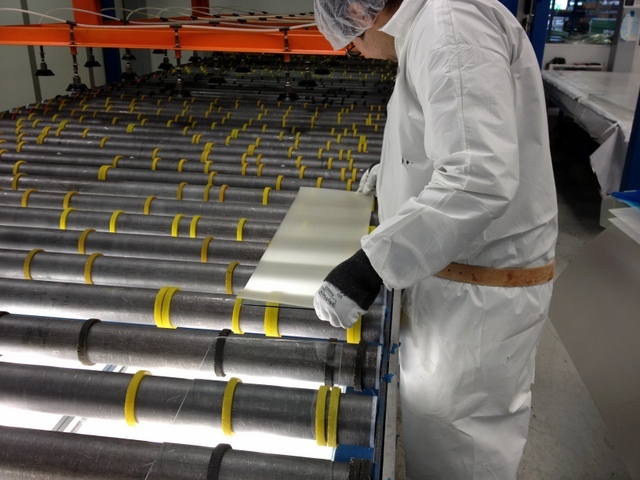 This highly effective method of nesting results in 80-95% material yield. When they are ready to cut, they simply pass our software a *.DXF file. 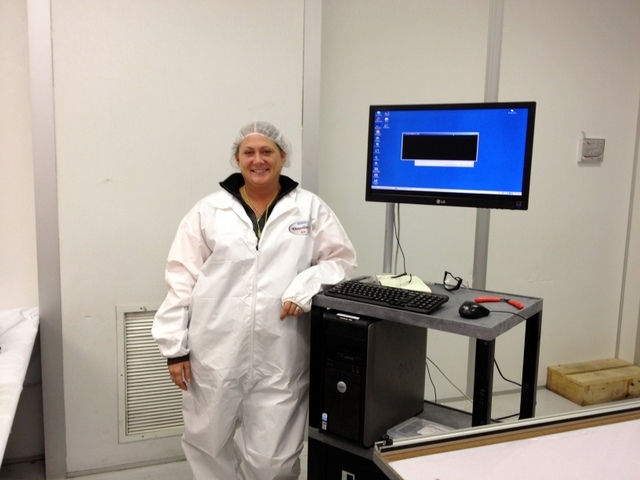 Heather from PMC made sure the PMC software seamlessly handed Carlson a cut-ready file. In addition to material savings, layups are also much faster because there is no need for post trimming. After cutting nested parts, the plotter/cutter parks out of the way. Cutting is now an entry level position. 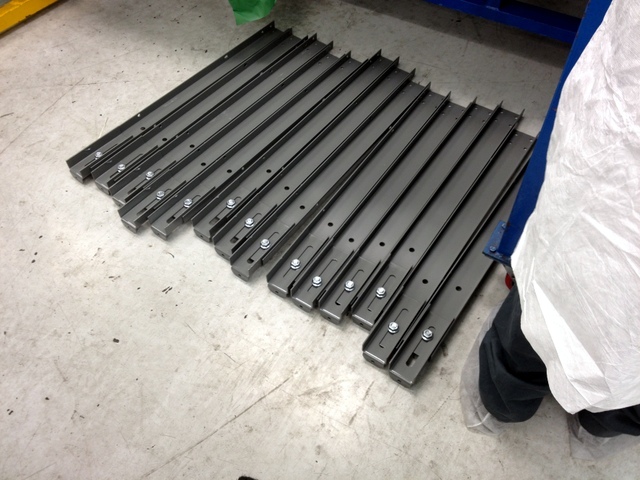 Parts lift right out, ready for layup. This reduces material handling. 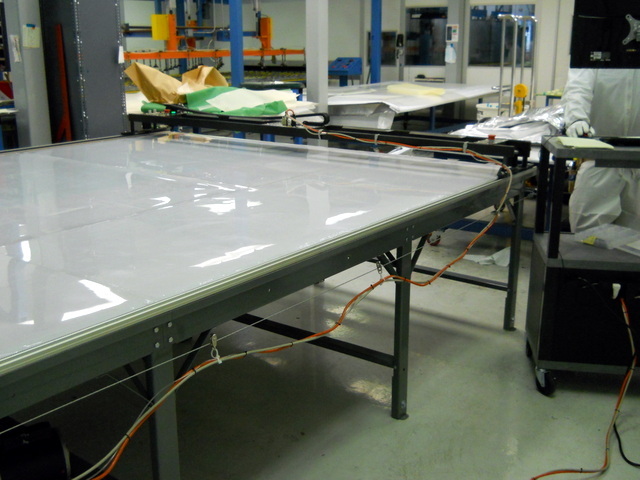 Large parts layup without trimming, spinning glass, and no longer require two people. "Yawn" this is so easy now! Precision fit. You can size your cuts to fit exactly on, or slightly increase/decrease material size to accommodate your lamination technique. Small parts or parts with multiple layers are now much easier to layup. In the end, it's all thumbs up! That looks easy…but how do you get started? 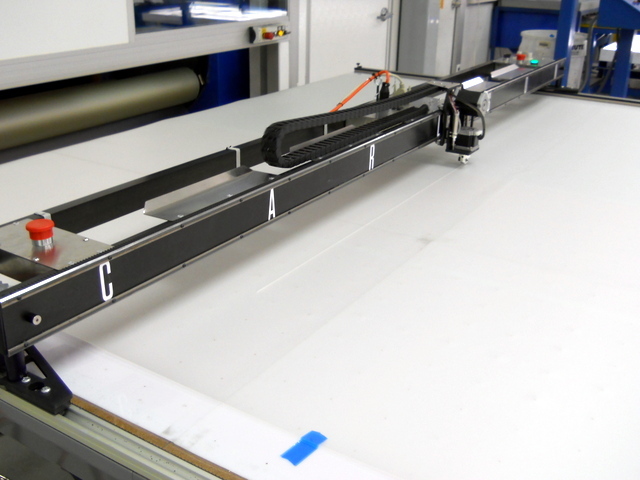 When integrating a plotter/cutter into a clean room, typically the first concern is space. 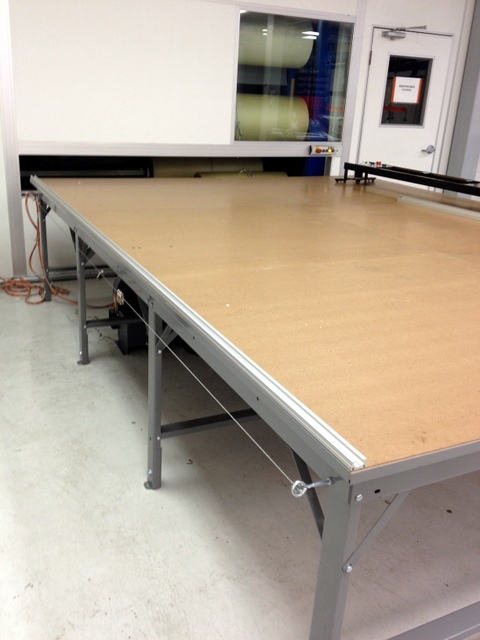 The plotter/cutter will take the place of your existing cutting table. 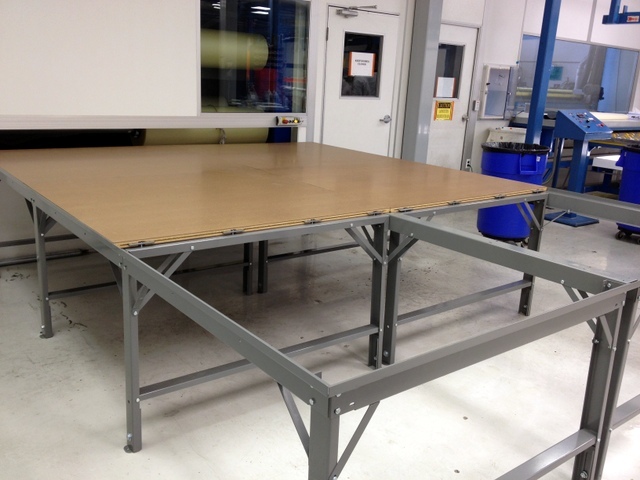 Our cutting tables do not require access to all sides of the table, so you can often work the system into a corner. 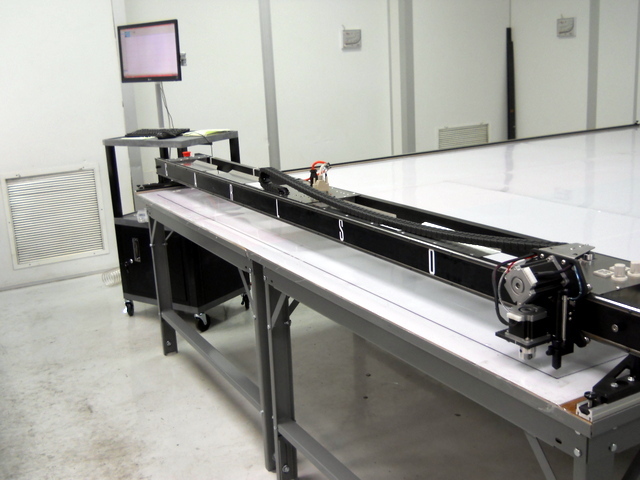 Our plotter/cutters are available in widths from 48″ to 168″+, but average sizes for lamination are 72″, 96″, and 108″. 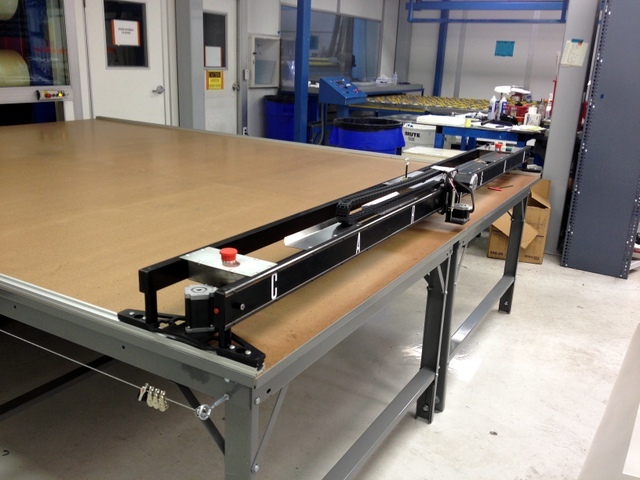 Let your average or max laminate roll width determine your table size. 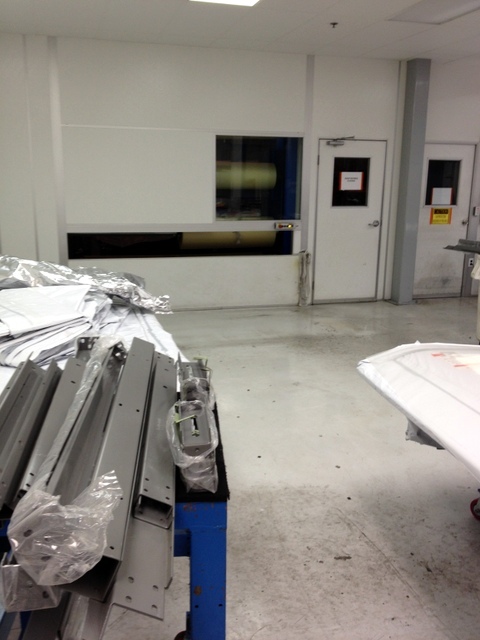 Oldcastle selected a 108″ wide machine to cut their 96″ wide PVB and SGP. Phillocraft tables come in endless 4' long sections, sized to width. 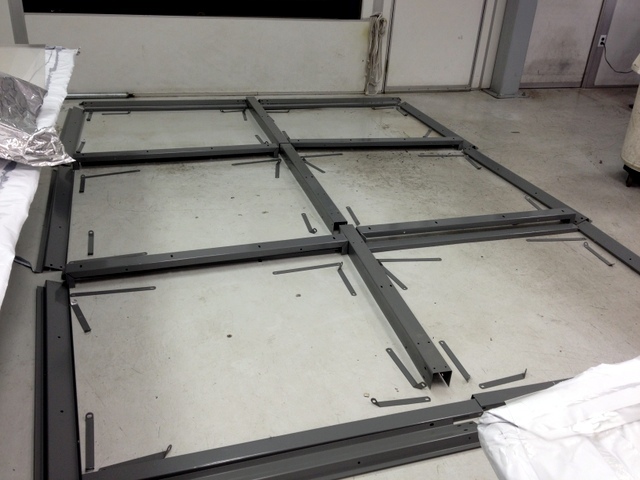 Broken down, they can easily be carried through even the tightest clean room door. 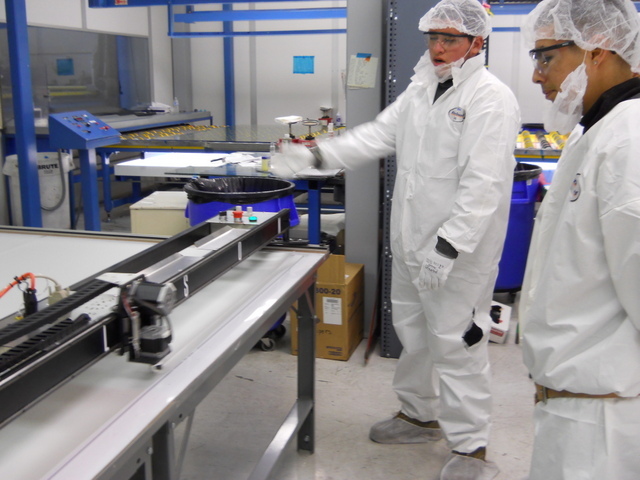 Clear a spot and carry the individual items into the clean room. Try to plan ahead to reduce the number of trips. 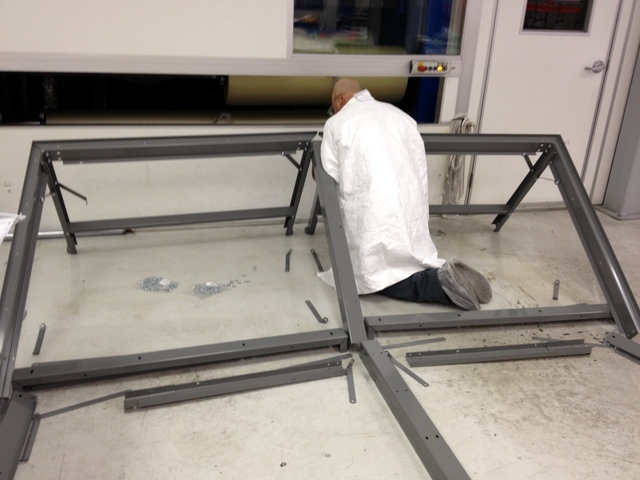 Layout your parts, starting with the legs. Layout the rest of the table parts. 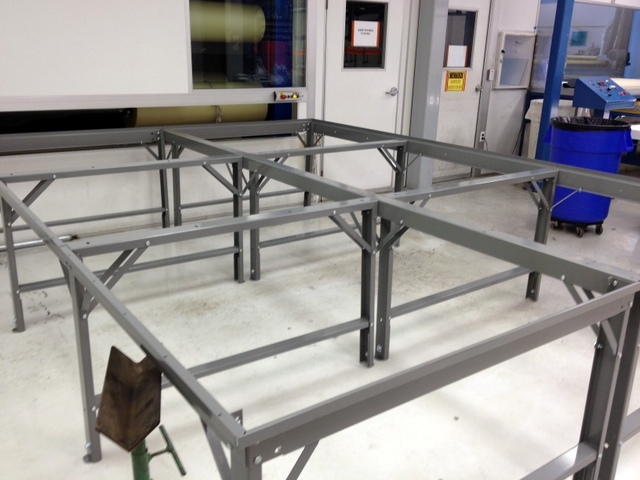 This will help you get a sense of where the table will sit in the room and will speed up assembly. Note, for tables wider than 96", the table frame is broken into multiple widths, as well as lengths. 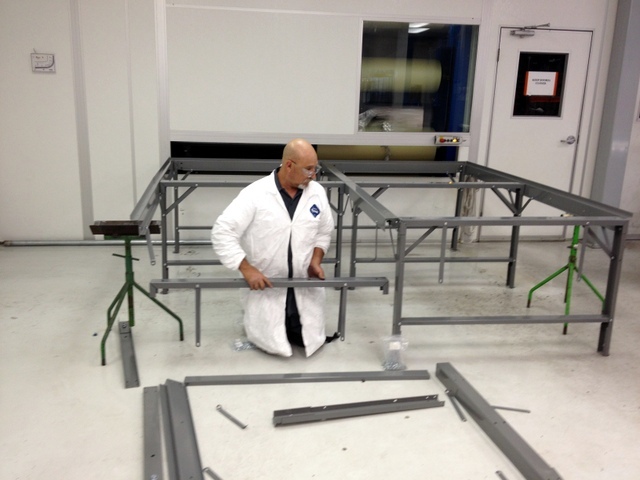 Begin assembling the table. Two people make this go much faster - thanks Ben! The entire installation will take about eight hours, so plan to have your cutting area out of commissioning for at least one shift. Framing complete! Before adding the table tops, it is important you position your table where you would like it to remain. Once settled, add the table tops. Square and level your table. Now you can tighten all nuts and bolts. Attach the vacuum plumbing. 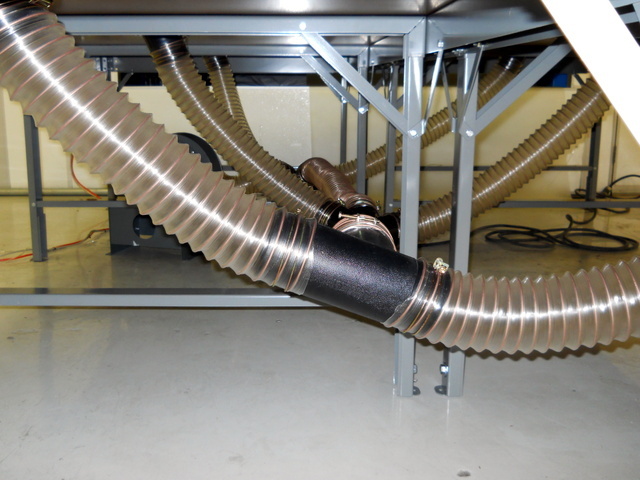 In a clean room, we use flexible plumbing so that additional vacuum can easily be added if needed. 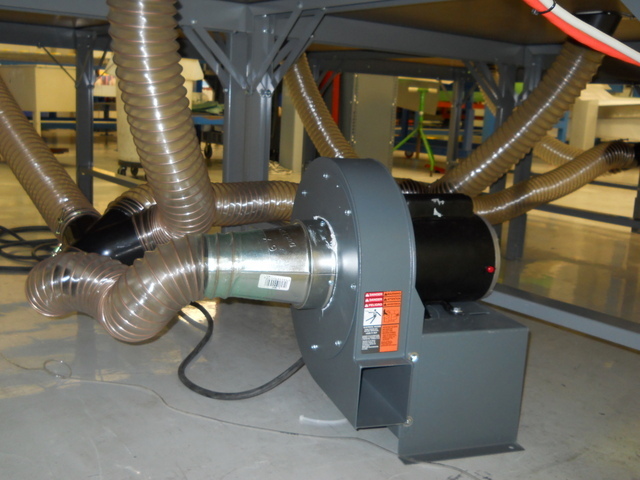 It is common to use smaller HP blowers to limit the amount of air stirred around the room. This 1.5HP, single phase 115vac blower is sized to provide enough suction for a table completely covered with non-porous laminate. Mount track side A. Please take the time to clearly follow the track installation instructions. Pull out your plotter/cutter. Admire. You will use the machine as a jig to square your track. 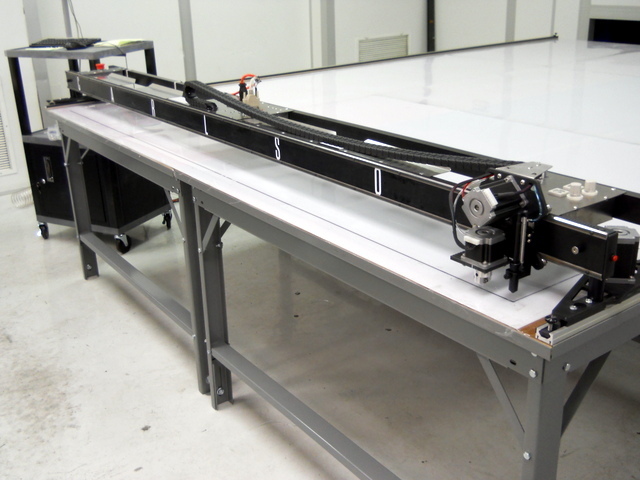 Your plotter/cutter is almost installed. 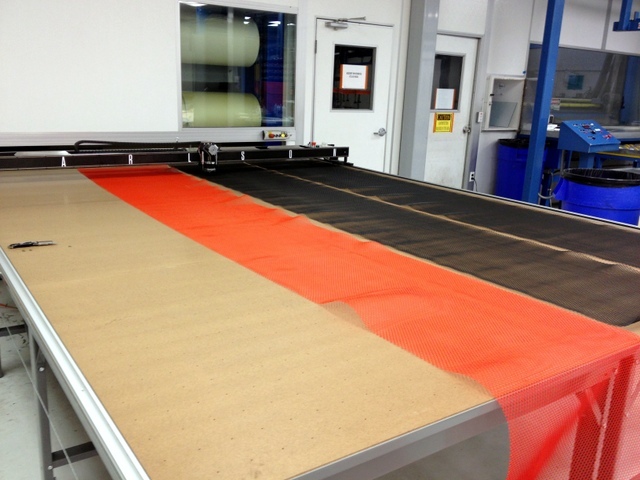 Prepare your cutting surface by first laying down strips of vacuum breather mesh. This will allow air to flow between your table top and cutting surface. 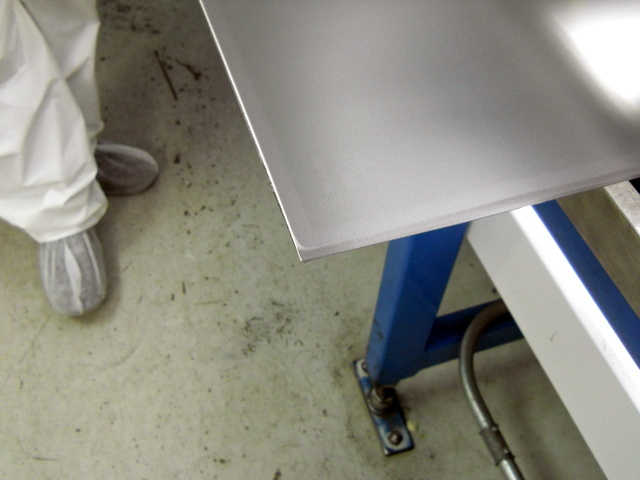 Attach plastic cutting surface. 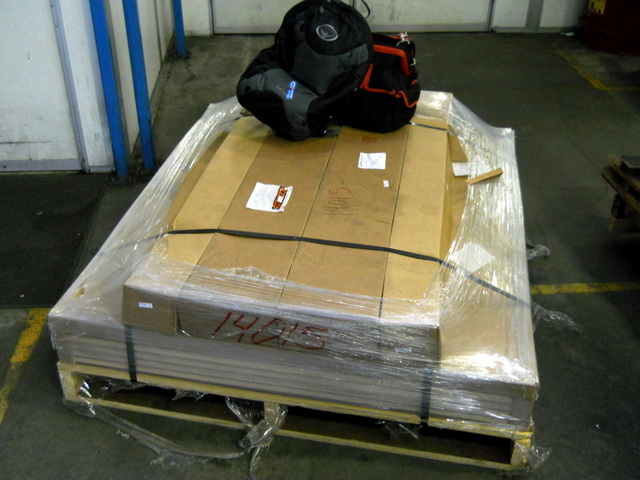 The cutting surface is secured with packing tape. Flip and rotate sides until you discover the best fit that offers the smallest gaps between sections. Often, the plastic at the front of the table will wear before the end. A good solution is replacing the first 1' of cutting surface with a narrow strip that can quickly be replaced as it wears. Assemble your operator's workstation. 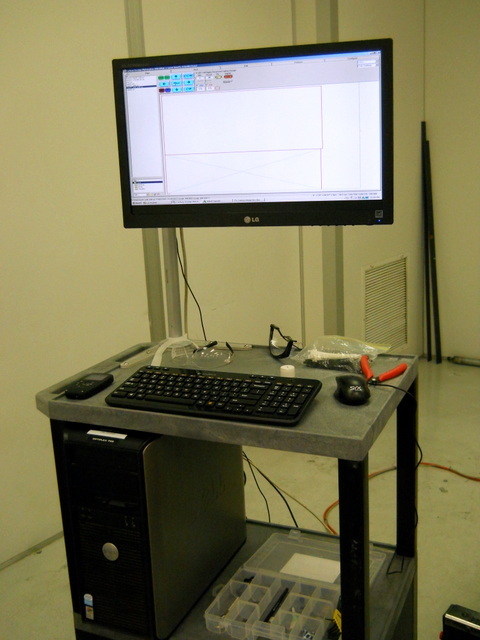 The workstation can be any area where you can place a monitor, keyboard, and computer. 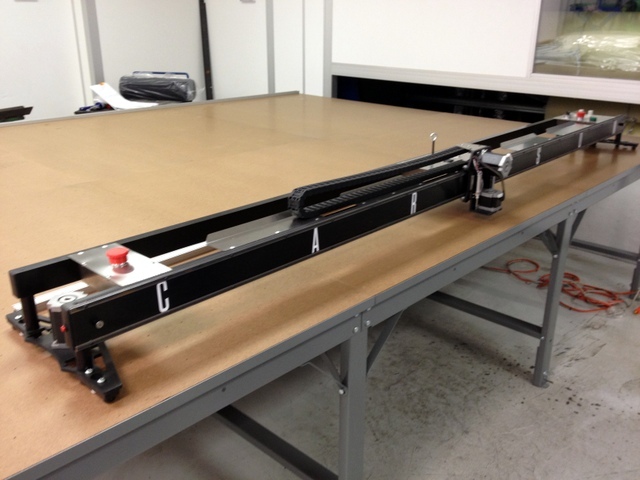 We like to use tuffy carts on wheels, with a lockable storage container and wide screen monitor. Our computers tuck nicely inside, along with manual and spares kit. Unfortunately our PC was not setup for their network during the training session, so we used an old existing tower PC from someone's office. 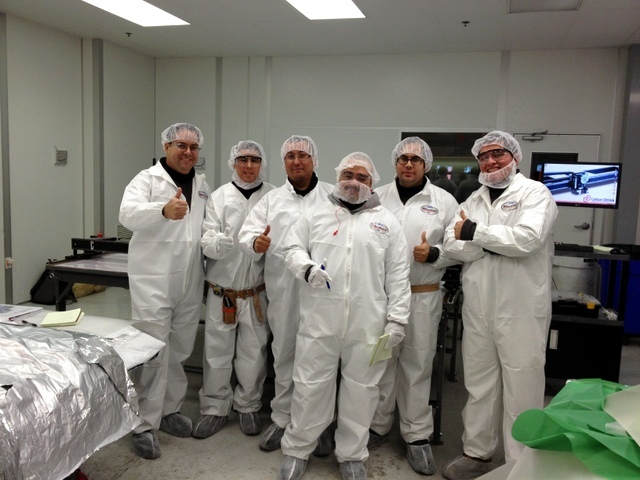 Carlson systems are very flexible! Finally, install plotter/cables and cable management. 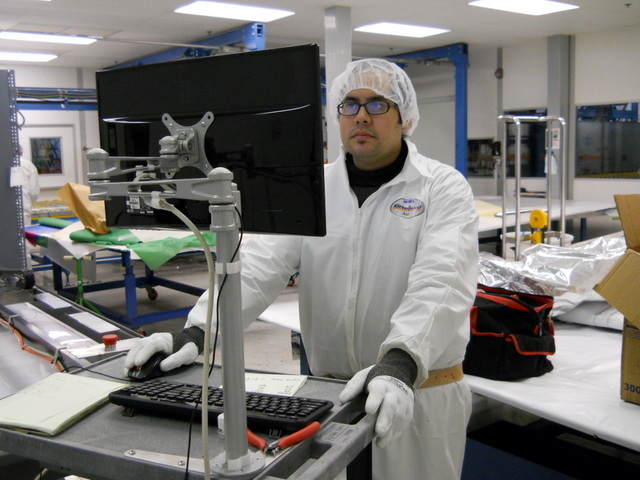 It may take a week or more of actual production to determine exactly where you want your workstation. Once you've selected a final location, then you can run more permanently secure your cabling. To start, hang them off the side of the table with the least traffic. In time, these can be run overhead, under the table, or left as is. Ta Da! You have successfully installed your plotter/cutter. Tomorrow the training begins. 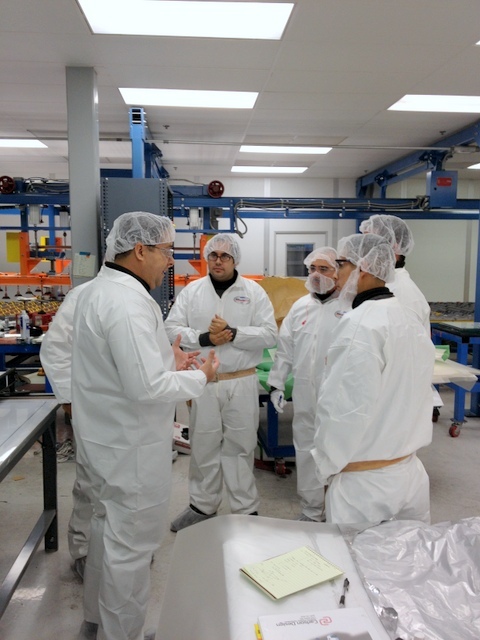 To begin training, we recommend gathering everyone who might interact with the machine for an introductory session. We start by explaining what's what. Group training is important, but only for the first session. After this, we need to select our "go-to" operator. Training a specific operator is ideal. They will be our contact for service and support -- even if they don't actually service the machine. Our systems are very simple, so most learning occurs through repetition. 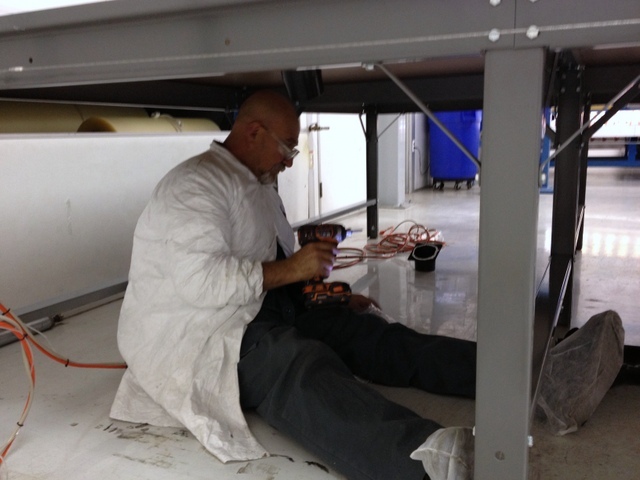 Over the course of an install, there is typically only time for one person to really become a proficient operator. Once trained, this person can train others to use the system. 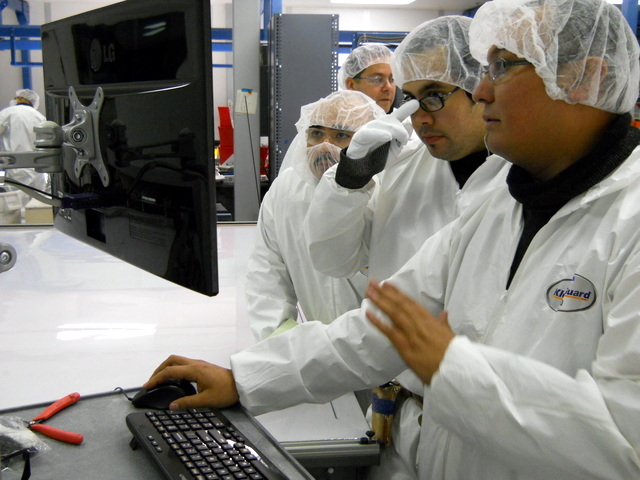 In a production environment, it is not uncommon for there to be multiple operators, over multiple shifts. Teaching is one of the best ways to really learn something. Final thumbs up! Big thanks to Roy, Phil, Rick, Todd, Heather, and Benjamin for all their help making this a successful install. Happy cutting!